This is a Post from the Symbol Surfing Blog from Fri, Jul 27, 2018. 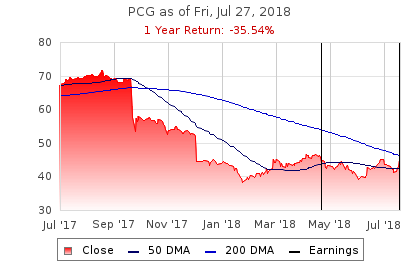 Today I bought the PCG Jan 18 2019 50.0 Put @ $7.15 to close out the position. This was a long 7 month trade. Interestingly enough, the stock price today was $44.70. The stock price did not move much since Fri, Jan 5, 2018 when it was at $44.29. I sold the option at $8 and bought it at $7.15. The return on the option trade was a little over 10%. If I had purchased the stock, the return would have been about 1%. $0.41 / $44.29 = 1% plus a couple of dividend payments. Oh wait, PCG suspended it's dividend. So the stock price return would have been 1%. This is a situation where selling a put performed better than buying the stock.